Liam Cameron won’t have the ‘surprise element’ when he defends his Commonwealth title against Danny Butler next month. 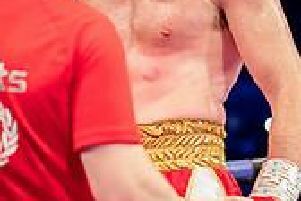 Promoter Dennis Hobson believes British boxing has woken up to the Sheffield middleweight’s potential after his win over city rival Sam Sheedy. And Hobson thinks Butler will be more than up for the task of taking Cameron’s belt from him. “It’s a tough fight and it could be a lot tougher than the Sam Sheedy fight because I think Liam caught Sheedy by surprise” he said. “Now, Liam has set his standard and Butler will know what he’s up against. “In my own mind, I think that Sheedy took Cameron lightly and I’m not taking anything away from Liam’s performance because I knew he could achieve that level, but he won’t be underestimated any more. “I’m not saying that he wouldn’t have beaten Sheedy anyway. Butler is experienced and it’s a massive opportunity for him to win a major title. Hobson pointed out that the 30 year old challenger from Bristol “has been an IBO international champion, he’s been the English champion, and he fought for the British title against former world champion Darren Barker. So, he’s fought in good company and is very capable. The pair lock horns at iceSheffield on April 27. Manor Park’s Cameron, 27, is currently hot weather training in Lanzarote, along with trainer Chris Smedley. * Hobson is co-promoting the Freesports-televised show with a Canadian company and will have include some Canadian fighters on it. It is not clear yet whether Curtis Woodhouse will be on the card. * Sheffield light middleweight Kell Brook is training in Miami- at the famous 5th St gym - as his promotional team work on his next assignment.